The United States Olympic Committee (USOC) was among the organisations which facilitated Larry Nassar's sexual abuse of hundreds of gymnasts and failed to act when the allegations against the disgraced doctor emerged, a damning independent report has claimed. 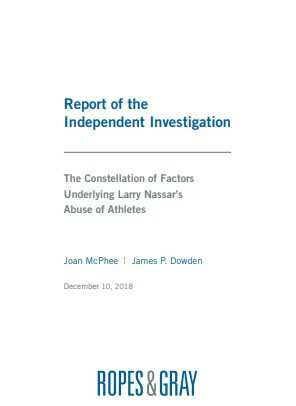 The report by law firm Ropes & Gray also accused USOC chief executive Scott Blackmun and chief of sport performance Alan Ashley of being aware of the accusations over a year before they became public. Ashley has today been sacked from his role following the release of the 252-page document, which details the lack of action taken by bodies including USA Gymnastics and the USOC. The independent investigation found that neither Blackmun nor Ashley "engaged with USA Gymnastics on the reported concerns, shared the information with others at the USOC or took any other action" when they learned of the allegations against Nassar in July 2015. It was not until September 2016 that Nassar's crimes entered into the public domain. Blackmun told investigators he had "initiated an internal effort at the USOC to alert his SafeSport team to the allegations and to confirm that the USOC was taking all appropriate steps to respond to the allegations and ensure athlete safety". This claim was dismissed in the report, which concluded "no such conversations were had and no such steps were taken". The report says Nassar, who was found guilty of sexually abusing dozens of American gymnasts under the guise of medical treatment in January and is now serving up 175 years in prison, "acted within an ecosystem that facilitated his criminal acts". "Numerous institutions and individuals enabled his abuse and failed to stop him, including coaches at the club and elite level, trainers and medical professionals, administrators and coaches at Michigan State University and officials at both USA Gymnastics and the USOC. "These institutions and individuals ignored red flags, failed to recognise textbook grooming behaviours, or in some egregious instances, dismissed clear calls for help from girls and young women who were being abused by Nassar. "While Nassar bears ultimate responsibility for his decades-long abuse of girls and young women, he did not operate in a vacuum." The report added Nassar "found an environment in elite gymnastics and Olympic sports that proved to be conducive to his criminal designs". His abuse of hundreds of girls and women was the "manifestation of the broader failures at USAG and the USOC to adopt appropriate child-protective policies and procedures to ensure a culture of safety for young athletes", the report added. In response, USOC chief executive Sarah Hirshland issued an apology and admitted the Olympic community in the country "failed the victims, survivors and their families". "The USOC board commissioned this independent investigation because we knew we had an obligation to find out how this happened and to take important steps to prevent and detect abuse," Hirshland added. 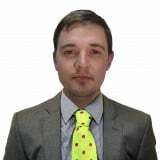 "We now have a much more comprehensive view of individual and institutional failures. "Everyone in the Olympic and Paralympic community, including the USOC, must learn from the report and take appropriate actions to strengthen protections for athletes. The release of the report substantiates much of the criticism USOC and USA Gymnastics has faced throughout the fallout to the sexual abuse scandal. Both organisations have been accused of failing to protect athletes and of ignoring the allegations made against Nassar. The Boston-based law firm were hired by the USOC in February to investigate and reviewed more than 1.3 million documents and interviewed more than 100 people. USOC has already taken steps to decertify USA Gymnastics as the governing body for the sport in the country following the scandal, while the embattled organisation recently filed for bankruptcy. USA Gymnastics has stressed this will enable it to "expeditiously resolve" the claims made by the survivors.